It’s been a while since I’ve taken the opportunity to use my blog posts as a means of expressing myself through my words. There has been SOOOOOO much in my head as of late and I’ve neglected to release these thoughts, ideas, feelings, etc. the only way I truly know how. Tossing all of that into my creative outlets is why I started blogging/creating in the first place. So, it’s time for me to fall back and relive the basics. I want to fall in love with my passions again, you know what I mean? After all, they are my passions. Nothing you enjoy doing or spending your time on should be forced. I more “I feel like blogging today” or “I got this awesome idea for new SwaggedOut merch” rather than “It’s been a week since I blogged and I sure don’t want to get kicked out of any groups.” I know my fellow bloggers can relate to that one! In all seriousness, though, taking a step back to breathe and reflect on why you work so hard for what you want, why you care so much, why you don’t want to be without it… it’s time I revisit that place again. So Morgynn hits me up to do a post together and, of course, I jump to it. We get situated, lookin’ good and who else but Micah Kalinakov as a, well, I’m still not quite sure what she is, photo bombs. Good times. Jeans :: `Blvck Anchor` LB Jeans Dye v1 NEW! Check out Morgynn’s look HERE. 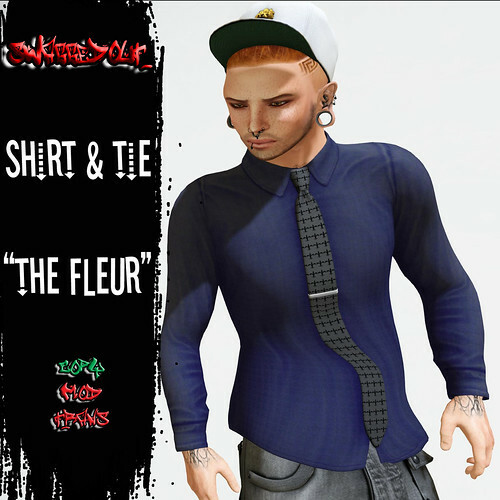 ALSO, THIS IS YOUR LAST CHANCE TO PURCHASE THE SWAGGEDOUT EXCLUSIVE “THE FLEUR” SHIRT & TIE @ 100 BLOCK! ENDS TOMORROW! THE SWAGGEDOUT MARKETPLACE STORE IS OFFICIALLY OPEN! I’m so proud of the work I’ve been doing the last week or so. Things are going great and I am learning so much! Along with the SwaggedOut snapbacks and baseball tees that are already available, I would like to introduce everyone to Lee. Sure, you’ve seen this template around, but Lee is different. I wanted to make him a cool dude, yet with a classy sense of style, ranging from Burberry (pictured above), Houndstooth, Argyle and Plaid. Check out all four variations HERE. Hair :: Unorthodox – Shaun Ross NEW! Snapback :: `Blvck Anchor` Crooks Black NEW! 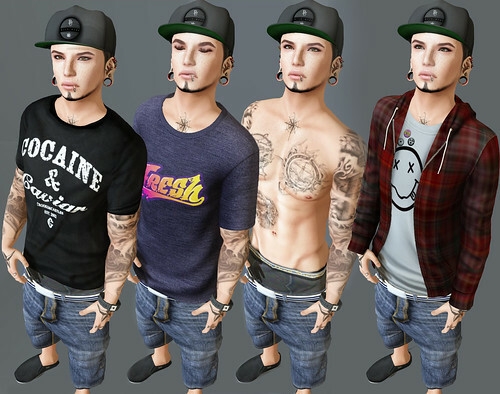 Shirt :: SwaggedOut – Lee – Burberry NEW! Backpack :: AITUI – Sk8 Bag NEW!